This IR remote control over CAT5/6 extender kit provides users with an easy solution for extending IR remote signal over the flexible CAT5/6 cable for longer range transmission. Its design allows users to conceal, yet still control home A/V equipments such as cable box, DVD player, etc. located behind closed doors, cabinet, closet or in other rooms/building. Users can manage up to 5 source equipments when both the IR transmitter and receiver units are used. And the maximum range of IR remote control signal can be extended as far as 800ft or 250 meters. Simply install the receiver unit near the receiving end such as TV or speaker system where you should aim your remote control toward. And put transmitter unit near the source device such as DVD player. Next, run a Ethernet cable in between and plug all the IR blaster/emitter and IR sensor wires to transmitter and receiver unit accordingly. That is all you have to do. The IR transmitter itself can act as a stand alone 1 in 2 out IR remote control blaster repeater through using the supplied splitter cords and IR blaster/emitter wires for controlling local equipments. The IR remote receiver/extender unit could be for optional use when longer distance control needed. 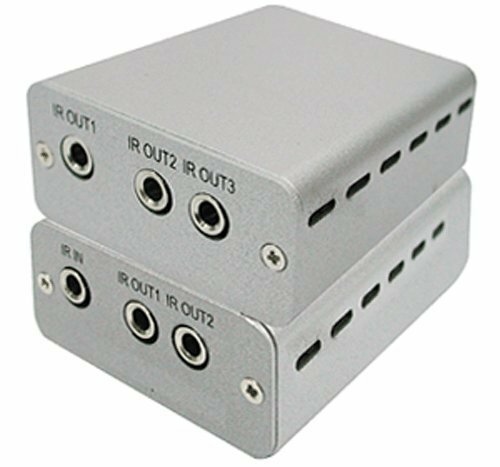 The IR receiver unit can provide total 3 IR outputsl for maximum control of 3 A/V equipments at greater distance. Each standard package includes 1 of IR remote sensor wire and 5 of IR remote blaster/emitter wires. Each wire is 6.5 feet long and uses 3.5mm headphone plug. Users can also use longer 3.5mm audio extension cables for cable extension if needed. Great IR over Cat5/6 transmitter solution for extending IR remote control operation to greater distance by sending the infrared remote control signals over CAT5 or CAT6 cable. Using existing remote controllers to manage multiple IR-controlled devices through the door, cabinet, floors, walls or other barriers with maximum range of 800ft using one CAT5 or CAT6 Ethernet cable. Users can put IR-controlled electronic equipments out of sight, yet still able to operate them within 800ft/200m range. Supports IR remote control for maximum total of 5 different IR-controlled devices with 3 IR blaster outputs provided by the receiver/extender unit and 2 IR blaster outputs provided by IR transmitter/repeater unit. The IR transmitter itself can act as a stand alone 1 in 2 out IR remote control blaster repeater through using the supplied IR blaster/emitter wires. The IR receiver unit can provide total 3 IR outputs through using the supplied IR blaster/emitter wires for control 3 equipments at far end. Solid IR remote control signal guaranteed all the way compared with the wireless solution. Single power supply shared by both IR TX and RX unit. Power adapter can be connected into either the TX unit or RX unit. Wide-range product applications for home theater/entertainment setup, conference room, multimedia center, classroom, trade show, business presentation and other commercial A/V installations. Fully compliant with standard modulated IR and the latest IRDA. Remote units come with buffered and boosted outputs. 6.5-feet long IR remote sensor wire and IR blaster/emitter wires included. IR remote sensor wire and IR blaster/emitter wires can easily be extended by using longer 3.5mm extension cables for desired distance. View More In Remote-Control Extenders.